Captured with Sharpcap and processed in Pixinsight. Taken from my home under Bortle 7 skies. And of course using my stunning 20" f3.74 Spica Eyes telescope on a Dual-axis Aluminum Equatorial Platform. 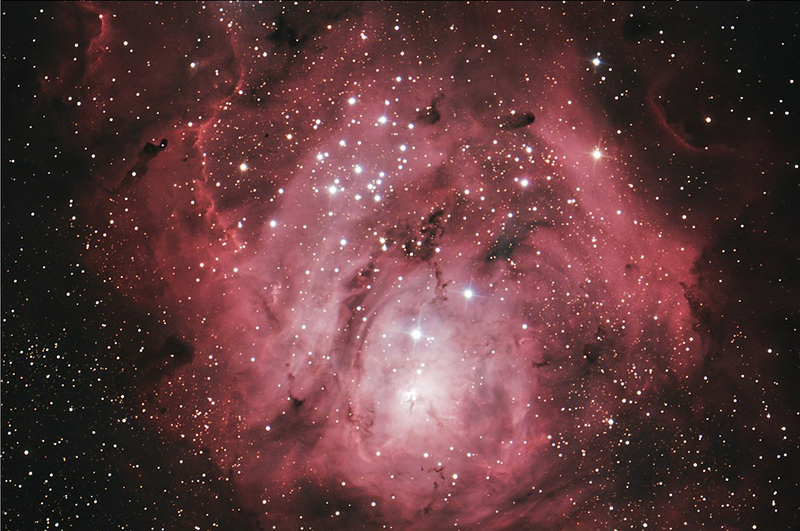 A splendid image of M8, the Lagoon Nebula, taken on July 12, 2018 by Marcus Hagi in Switzerland. A Baader-modified Canon EOS 450D Camera was used. Exposure time 1 hour 9 minutes, consisting of 23 three-minute exposures at ISO 800 with a 16 f/4.5 dobsonian on a Dual-axis Aluminum Platform. Many more of Marcus's wonderful Platform photos can be seen here. 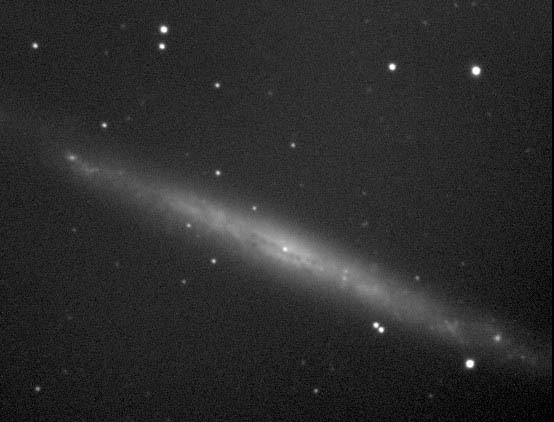 NGC 4631. This haunting image was taken by David Paul in England. He used a 30" Starstructure Horizon telescope with Lockwood optics. This scope was mounted on a Dual-axis Aluminum Platform, and all frames were unguided. An Atik Horizon (mono) CMOS camera was used with LRGB filters. Each filter was 20 frames (15 seconds each, unguided) processed using Pixinsight software. 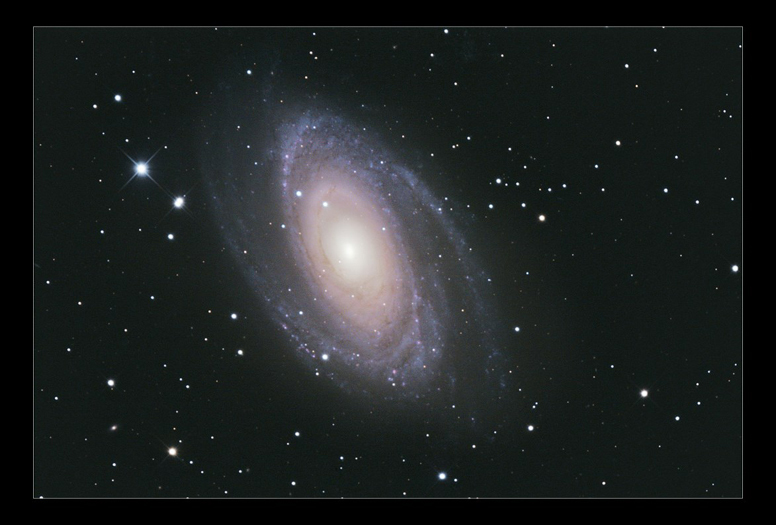 This beautiful detailed image of M81 was taken by David Paul in England. 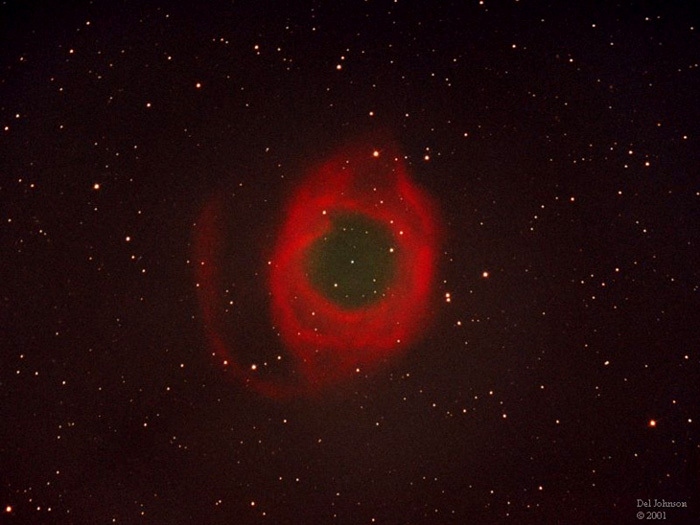 He used a 30" Starstructure Horizon telescope with Lockwood optics. This scope was mounted on a Dual-axis Aluminum Platform, and all frames were unguided. An Atik Horizon (mono) CMOS camera was used with LRGB filters. Each filter was 20 frames (15 seconds each) processed using Pixinsight software. 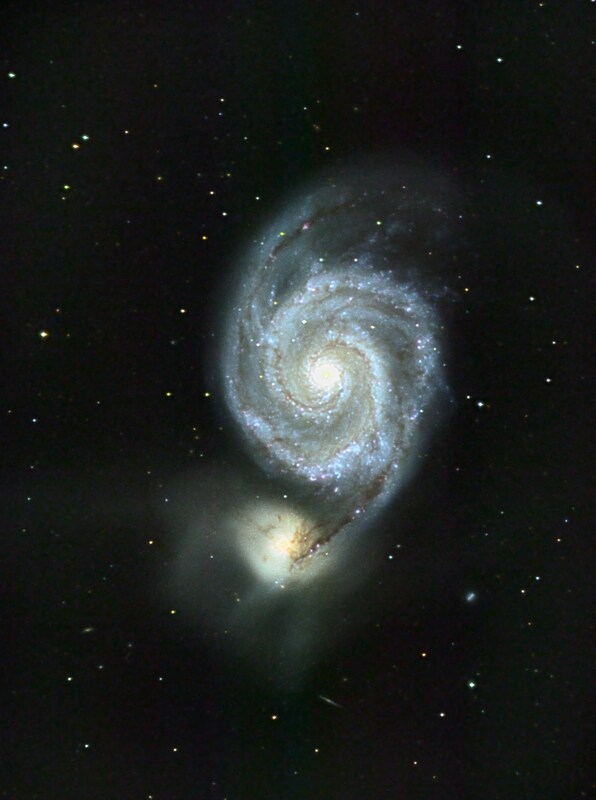 This gloriously detailed image of M51 was taken by David Paul in England. 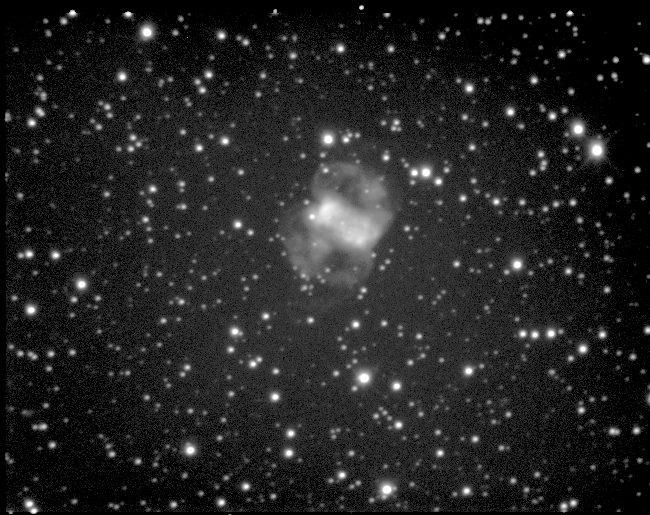 He used a 30" Starstructure Horizon telescope with Lockwood optics. This scope was mounted on a Dual-axis Aluminum Platform, and all frames were unguided. An Atik Horizon (mono) CMOS camera was used with LRGB filters. Each filter was 20 frames (15 seconds each) processed using Pixinsight software. 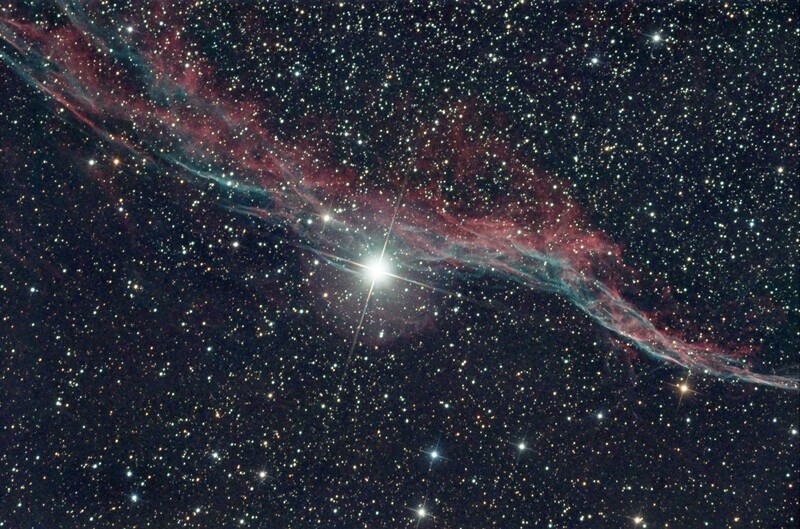 NGC6960, the Veil Nebula -- taken with an Explore Scientific 16" Dobsonian on a Dual-axis Aluminum Platform,, ASI1600MCC at -15°C, IDAS LPSV4 filter, no coma corrector. Click for full resolution image. Registration : Registax5, processed using Pixinsight. This is a stack of 170 five second exposures. Image by Olivier Bonnaveau of France. 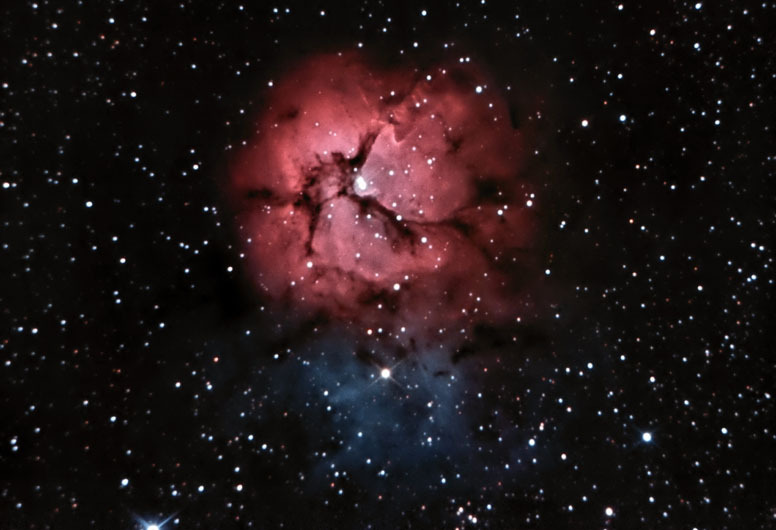 M20, the Trifid -- taken with an Explore Scientific 16" Dobsonian on a Dual-axis Aluminum Platform, ASI1600MCC at -15°C, IDAS LPSV4 filter, no coma corrector. Click for full resolution image. Registration : Registax5, processed using Pixinsight. This is a stack of 630 three second exposures. Image by Olivier Bonnaveau of France. 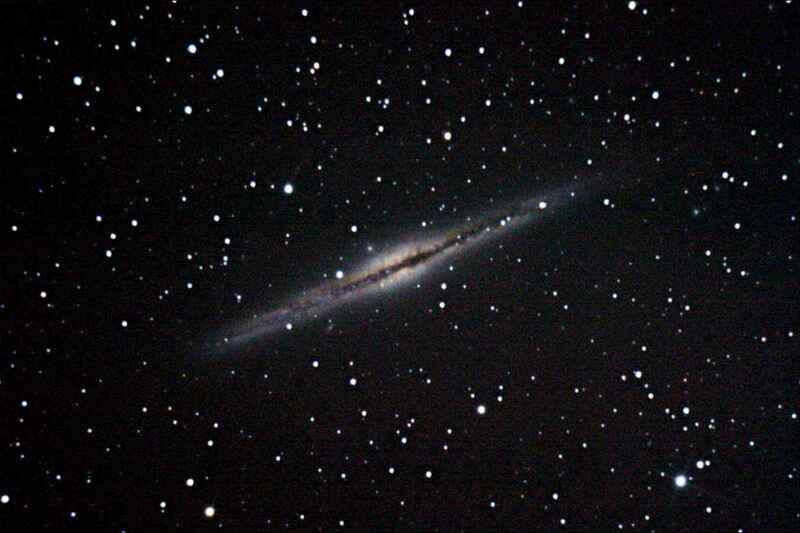 NGC 891 is a spiral galaxy seen edge-on in the constellation Andromeda, some 30 million light years from Earth. 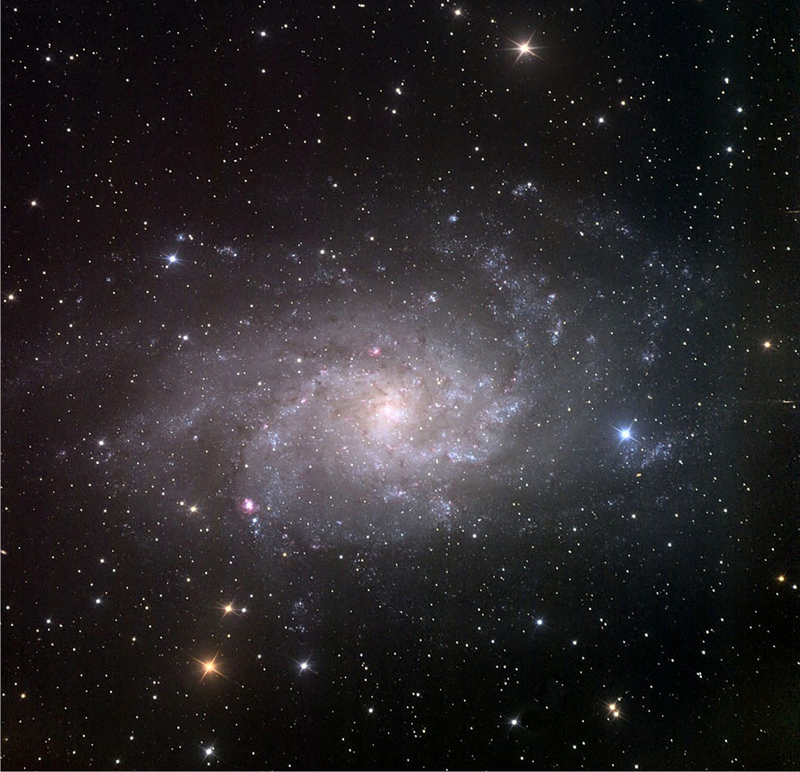 A dark dust lane can be seen across the whole length of the galaxy. 23 three-minute exposures at ISO 800 were combined for this image with DeepSkyStacker software, resulting in an 69 minute exposure (taken through a 16 f/4.5 reflector Ninja on a dual-axis aluminum equatorial platform, camera: Baader-modified Canon 450D, coma corrector: TeleVue Paracorr Type II, guiding: Lacerta off-axis system, Lacerta MGEN autoguider). Image processing was done in Photoshop. Photo by Marcus Hagi in Switzerland. 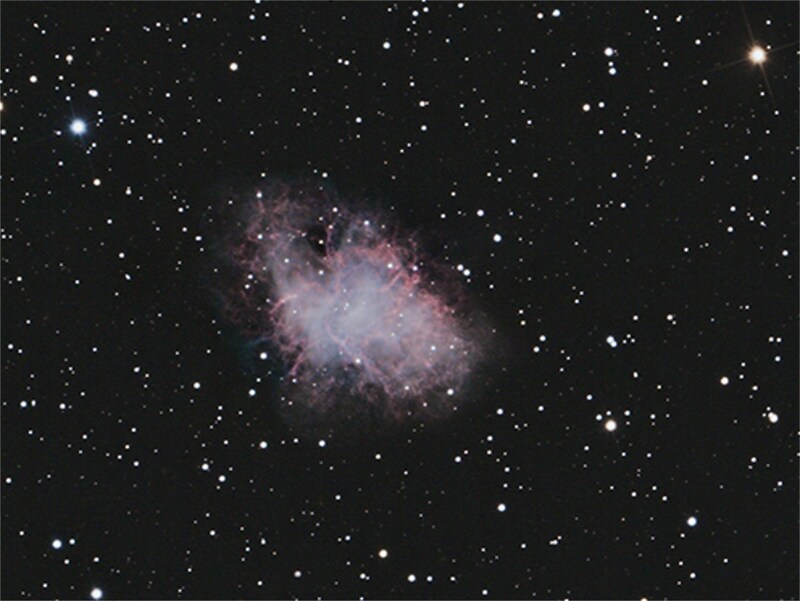 Messier 1, the famous Crab Nebula, is a supernova remnant 6500 light years from Earth. It is the result of a supernova explosion which was observed by Chinese astronomers in 1054. 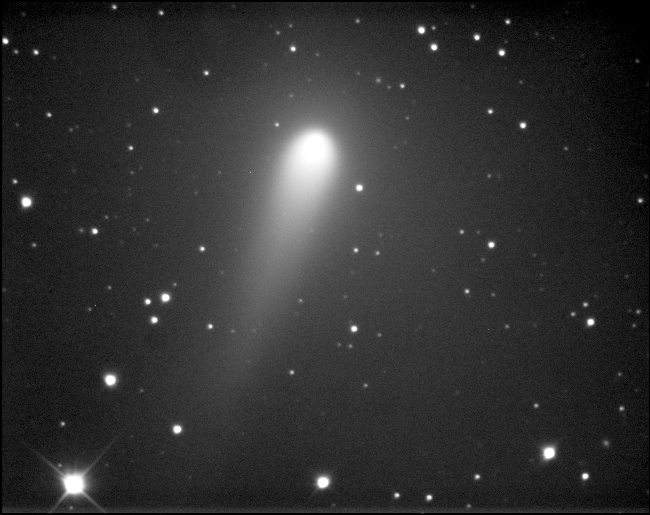 The guest star was visible during daylight for three weeks. 24 three-minute exposures at ISO 800 were combined (totaling 72 minutes) with DeepSkyStacker software and further processed in Photoshop. Telescope: 16 f/4.5 reflector Ninja on a dual-axis aluminum equatorial platform. Camera: Baader-modified Canon 450D camera. Coma Corrector: TeleVue Paracorr Type II. Guiding: Lacerta off-axis system, Lacerta MGEN autoguider. Photo by Marcus Hagi in Switzerland. 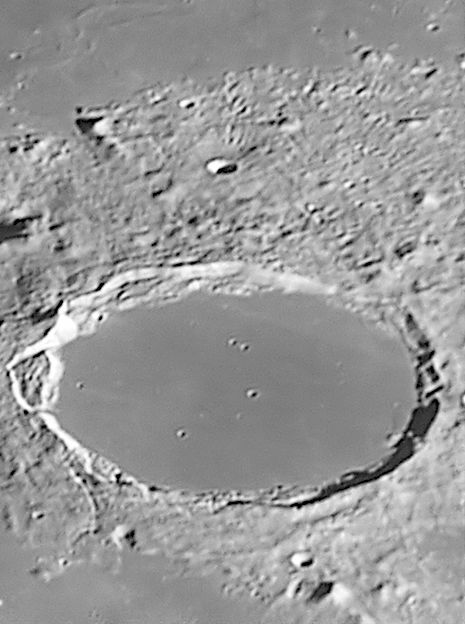 A description of how Marcus uses his Platform for this imaging, as well as links to more of his work with his Platform can be found at: http://www.utopia-photography.ch/telescopes/osypowski.html. 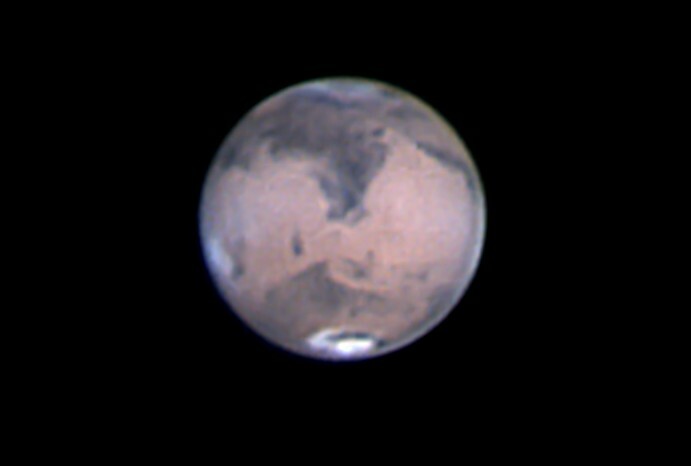 Javier Beltran Jovani has done it again -- another stunning planetary image, this one of Mars, taken with his 20" telescope on a Dual-axis Equatorial Platform. "Ive had two wonderful nights with your extraordinary platform  everything was working like a Swiss watch. 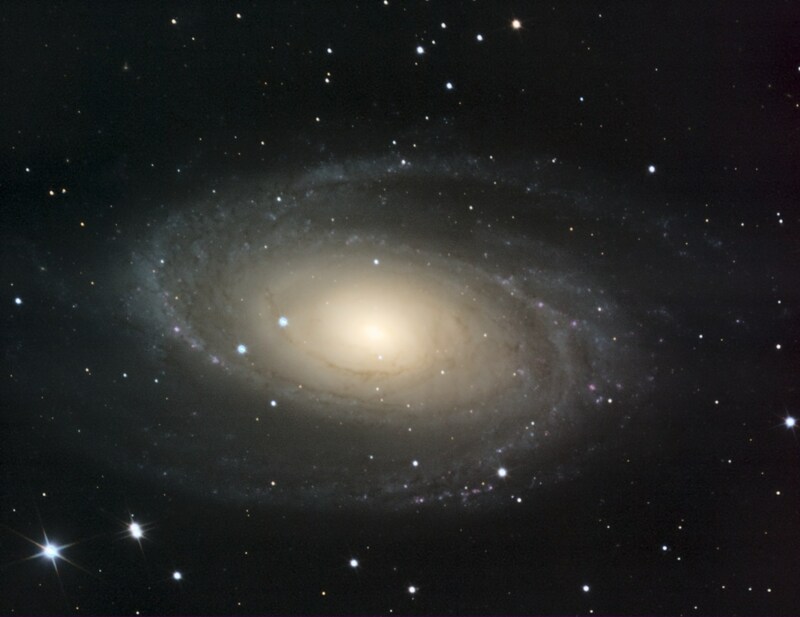 This image of M81 was taken on February 25 /26, 2014 through the 16 inch f/4.5 dobsonian telescope Ninja on a Dual-axis Aluminium Platform. 20 images of approximately 3 minutes exposure time at ISO 800 taken with a Baader-modified Canon EOS 450D camera were combined with the DeepSkyStacker software and further processed in Adobe Photoshop CS3. 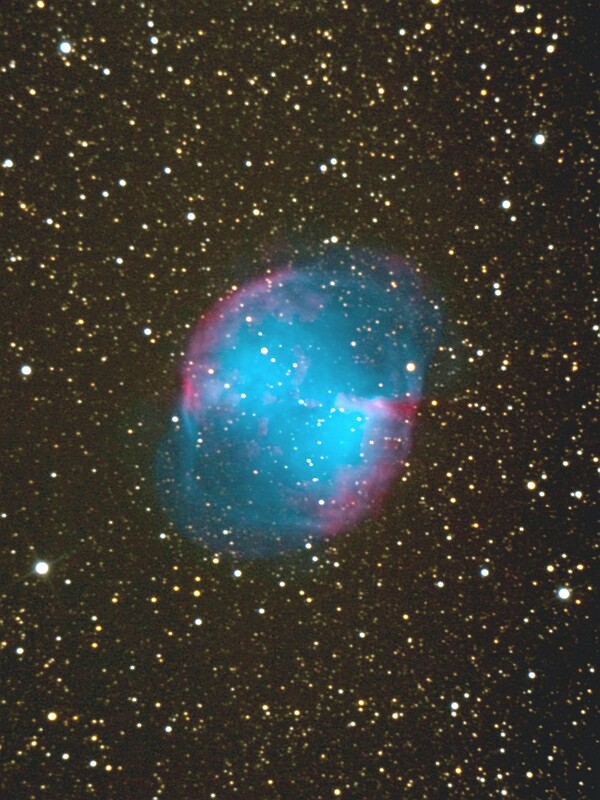 Total exposure time amounts to one hour and 5 minutes and no dark frames were taken. Guiding was done with a Lacerta MGEN autoguider and a Paracorr Type II coma corrector was used." More of Markus' pictures taken with his Platform can be seen on these two websites: here and here. You can also read about his procedures for using his Platform for imaging at this site. 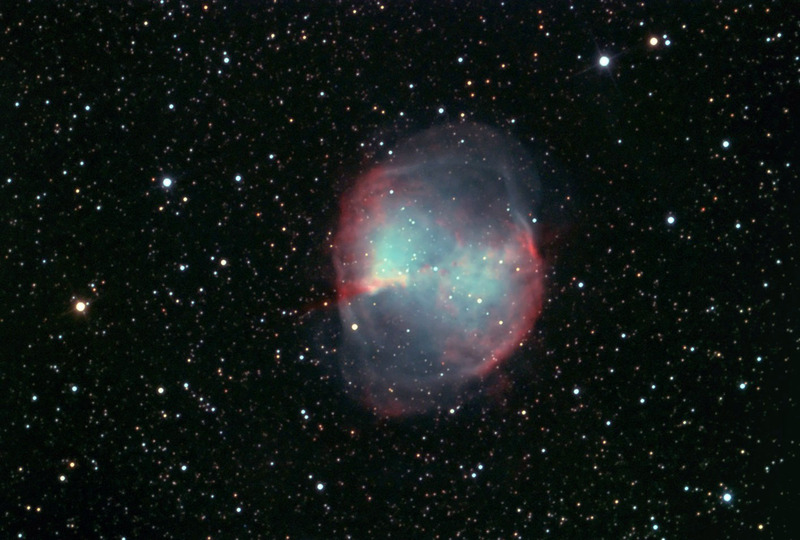 Nineteen exposures of approximately 3 minutes were added for this Messier 20 image, totaling 1 hour and 2 minutes of exposure time. 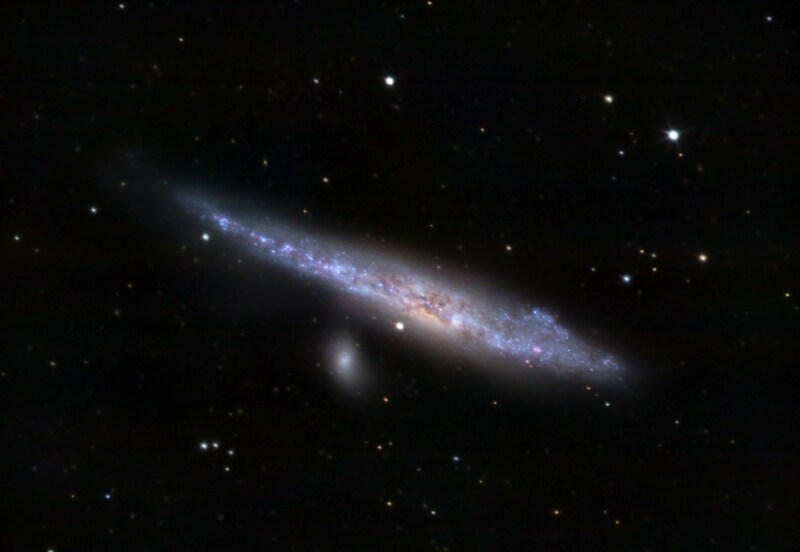 The image was taken on July 12 / 13, 2013 through a 16 f/4.5 Ninja dobsonian telescope sitting on an Aluminum Dual-axis Platform with a Paracorr Type II corrector, a Lacerta MGen autoguider and a Lacerta off-axis system. The camera, a Baader modified Canon 450D, was used at ISO 800 with no in-camera noise reduction. Stacking was done with the DeepSkyStacker software (with no dark frames used) and further image processing was done in Photoshop. Image by Marcus Hagi of Switzerland. 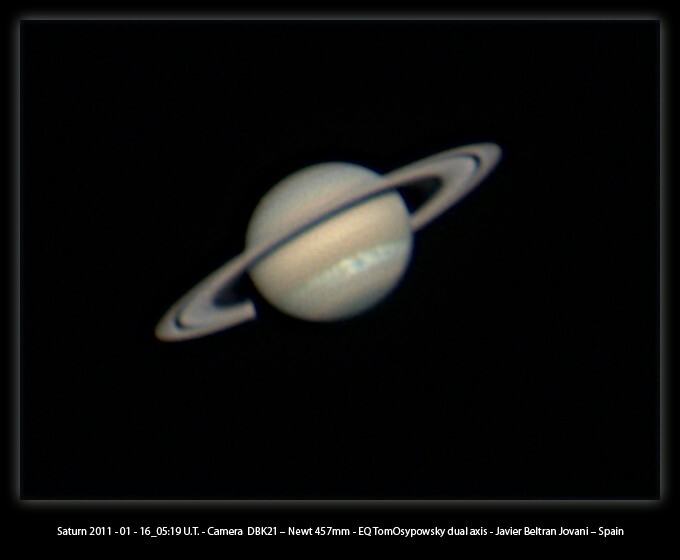 Saturn taken on May 24th 2012 by Marc Delcroix in France. "Despite the low altitude - Saturn is culminating at 40° this year from my observation location, I could take a good image of the planet thanks to a Atmospheric Dispersion Corrector. 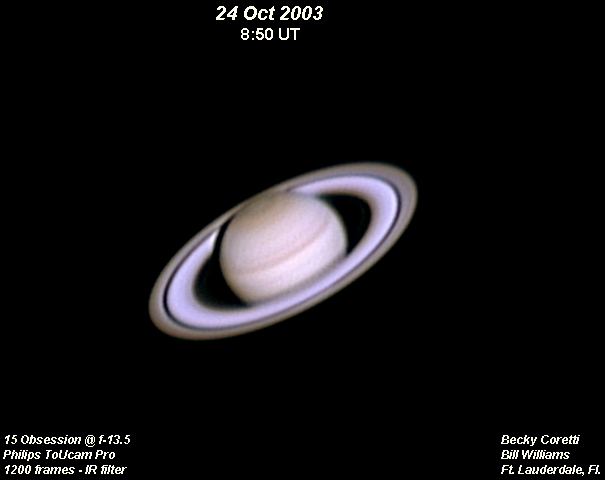 LRGB Saturn has been processed with Avistack, Iris and Photoshop." 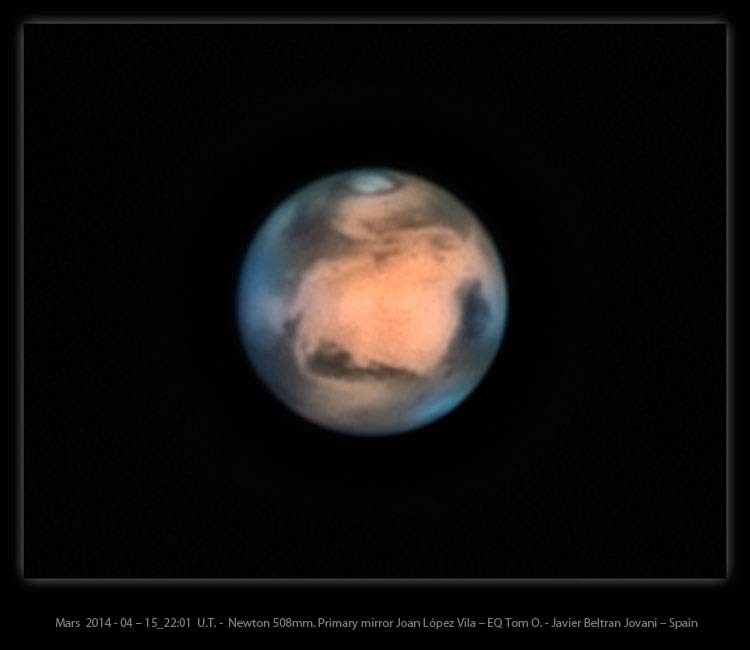 Mars taken by Javier Beltran Jovani in Spain on February 27, 2012. Javier used an 18" Dob on his Dual-axis Equatorial Platform to capture this image. "The camera we used is a Basler Ace acA640-100gm and the effective focal ratio was F/28.5. 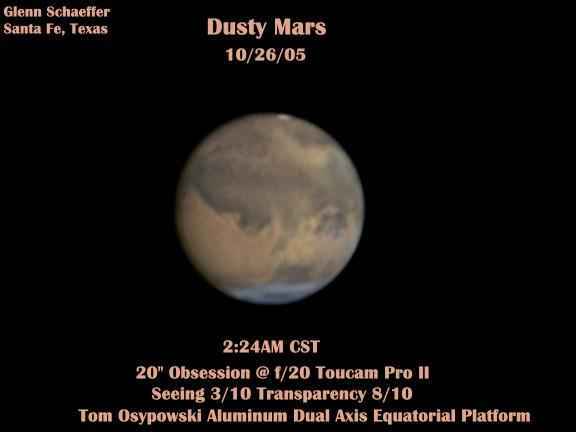 Date: October the first, around 23:53h (UTC). Image was taken during very good but foggy conditions. We constantly had to use a hair dryer (in fact it was a paint stripper!) to keep the optics free from moisture." 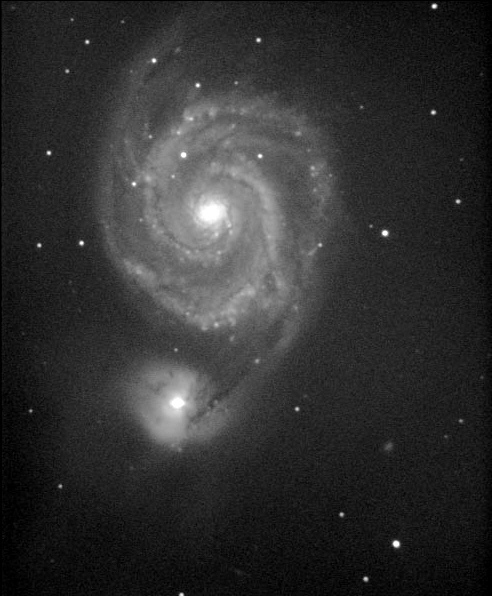 " Taken through a 16" f/5 Martini Dobson with Zambuto mirror on a Dual-axis Aluminum Platform (Canon 20Da, TS off-axis system, Paracorr Coma Corrector, Lacerta MGEN guider). The image is a combination of three images with 8 minutes exposure each (with dark frame subtraction done by the camera). The three images were put in different layers of the same Photoshop file, the first having 100% opacity, the second having 50% opacity and the third with 33% opacity (layer mode normal). The layers were flattened and some work on the curves was done." 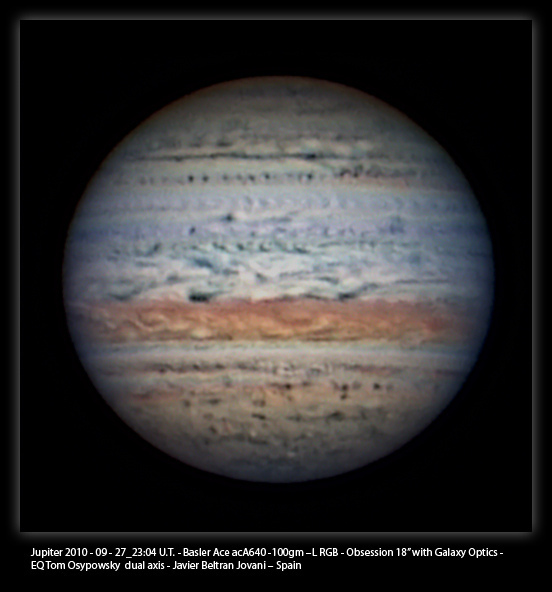 Javier Beltran Jovani of Spain has been doing cutting edge planetary imaging for years with his 18" Obsession on one of our Dual-axis Platforms. 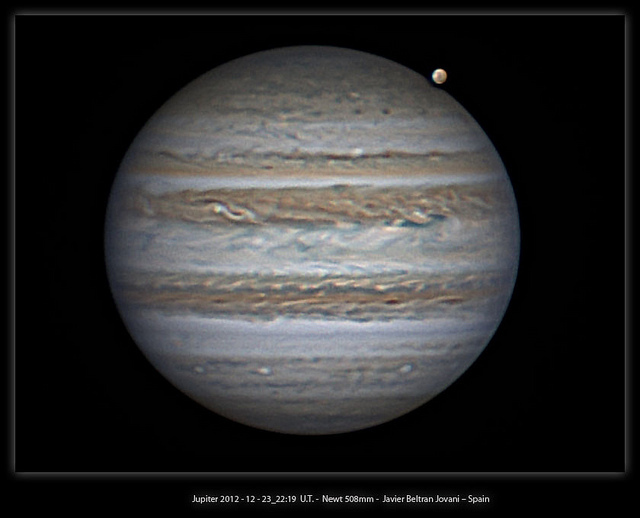 This is one of his latest images of Jupiter, showing Ganymede close to Jupiter and ready to go behind the planet. 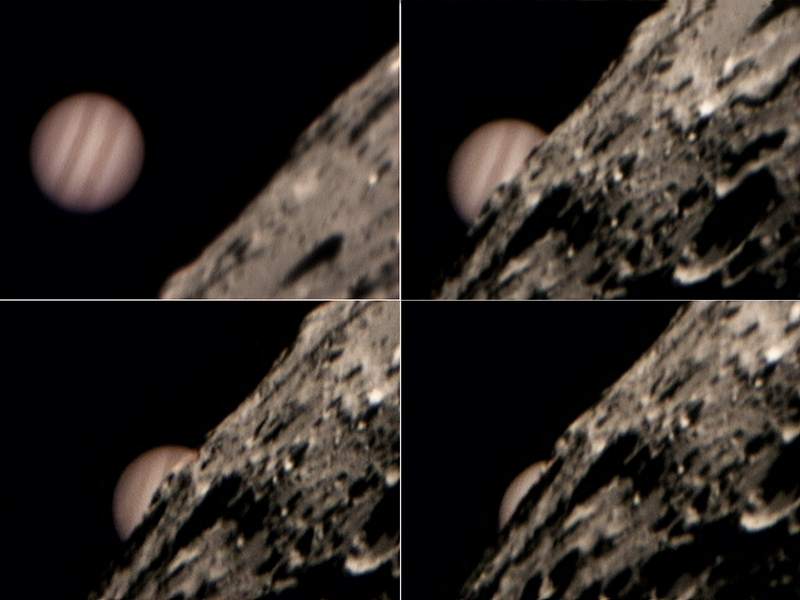 Note the amazing detail, not only on Jupiter itself, but also on Ganymede. 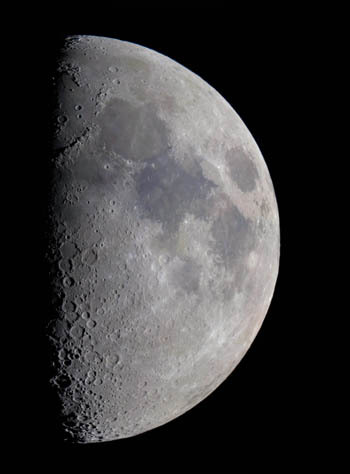 For a special treat, here is an animated gif showing the moon moving behind the planet. 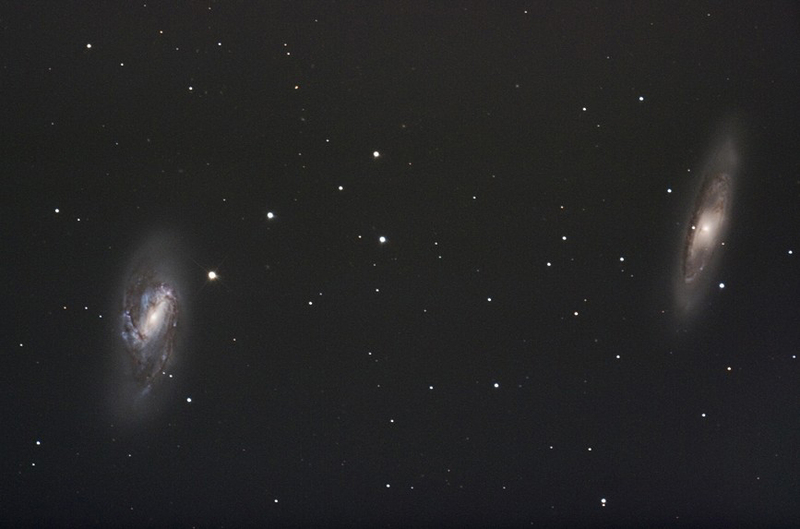 This beautiful portrait of M65 and M66 was shot by Markus Hagi in Switzerland with his new Dual-axis Aluminum Platform, using a 16" f5 Martini Dobson with a Zambuto mirror. Equipment used were a Canon 20Da, a TS off-axis system, a Paracorr Coma Corrector, and a Lacerta MGEN guider. The image is a combination of three images with 5, 6 and 8 minutes exposure times. For processing, Mr. Hagi says, "I put them in different layers of the same Photoshop file, the first having 100% opacity, the second having 50% opacity and the third with 33% opacity, flattened the image and did some work on the curves. 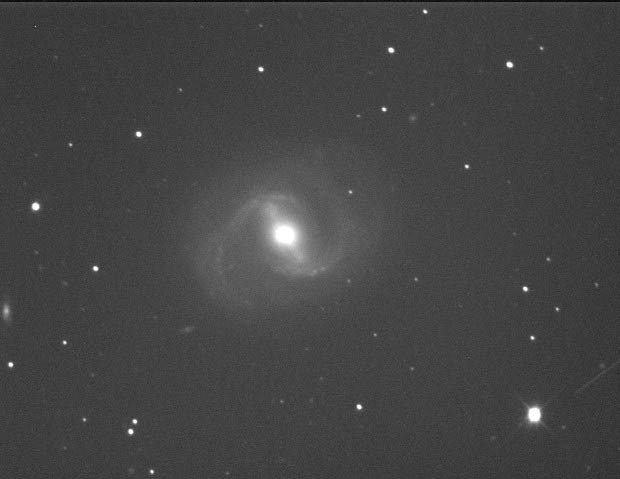 I then put a fourth image with 2 minutes exposure time on top of it with a layer mask (masking out all parts of this image except the center of the galaxies)." This is Mr. Hagi's first photo taken with his new Equatorial Platform, using an autoguider. Processing: Raw files converted with Photoshop CS3 to 16bit TIFs. Calibrated, aligned, and combined in Images Plus. Final color and luminance adjusted in ACDSee. The original 3036 x 2024 pixel image was resized to 67% and a 1024 x 768 crop taken for the final image. 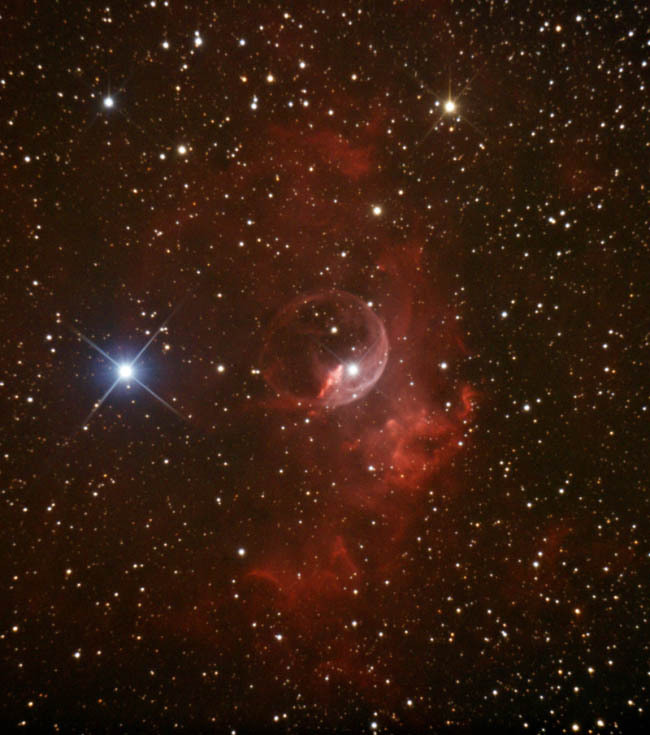 NGC 7635, also called the Bubble Nebula, is an emission nebula in the constellation Cassiopeia. 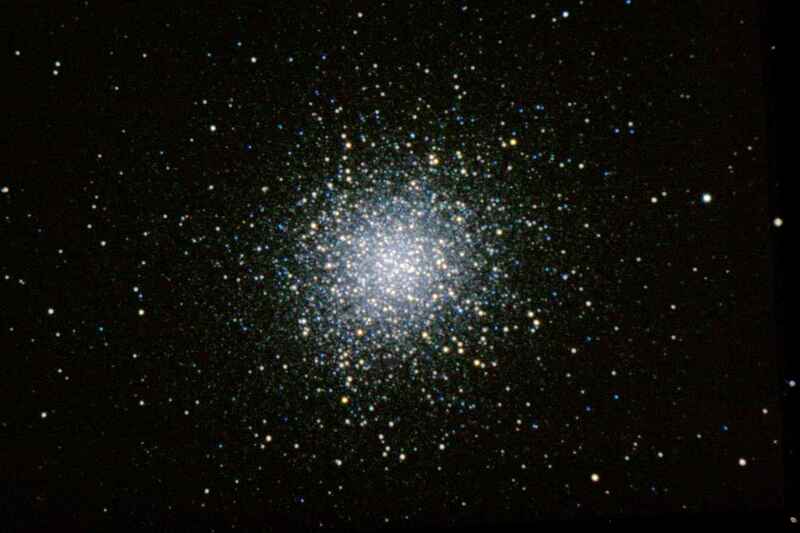 It is positioned close to the open cluster M52. 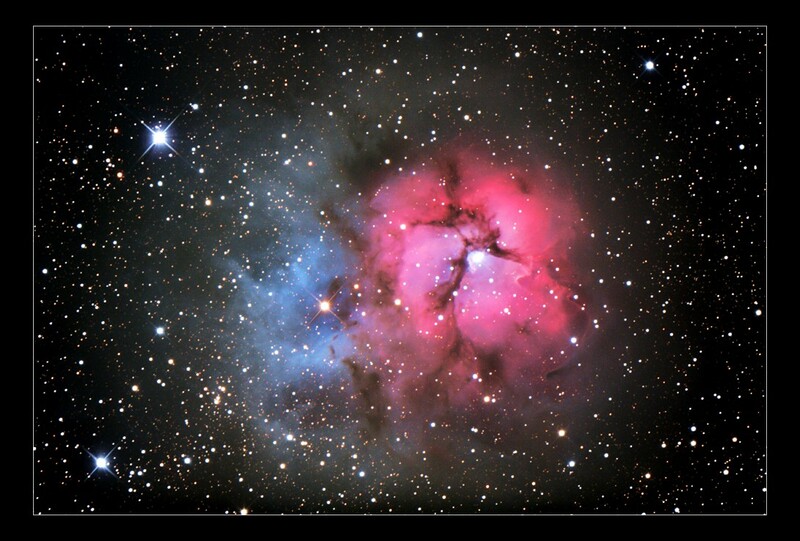 The "bubble" is created by the stellar wind from a massive hot 8.7 magnitude young central star. 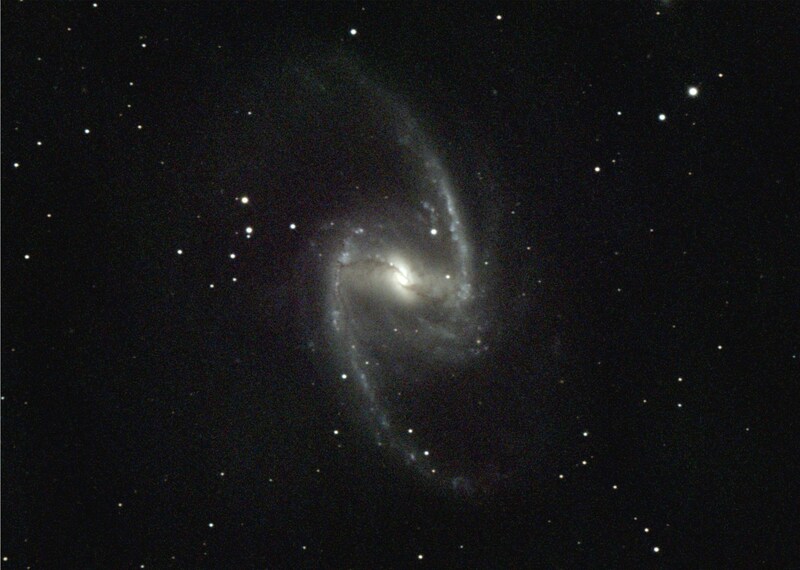 Even with my 20" scope in dark skies, visually this is a very challenging object. Date & Location: October 16th, 2009, Fort Mckavett, Texas. Scope: Obsession 20 f/5 on a Tom Osypowski Dual Axis Equatorial Platform, Orion 100mm f/6 Guidescope. Conditions: Temp 55F, Humidity 82%, Winds calm, Transparency 8/10, Seeing 7/10. Exposures: 16 x 120sec @ 1600 ISO Sub Frames, 9 Darks average combined for master dark. Scope: 12.5'' Dobson f/4.5 "Ninja"
Mount: Dual-axis Aluminum Platform by Equatorial Platforms. 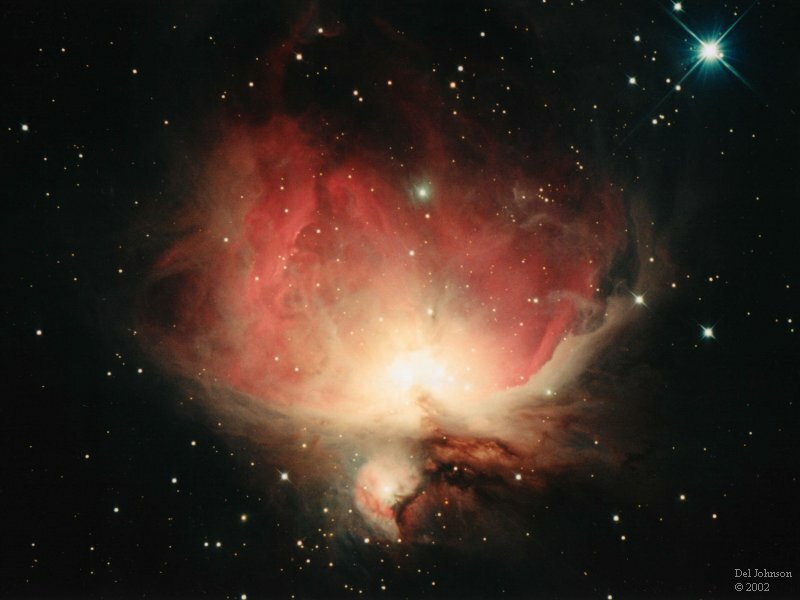 This image of M42 was taken by Bob Brunck with a 12.5" f/4.8 Dob on a Dual-axis Aluminum Platform with a Canon 40D (un-modded) and a Televue photo Paracorr, at ISO 800. It is the combination of 6 x 10s, 6x30s, 6 x 60s, and 6x 120s image frames processed in ImagesPlus and Photoshop CS4. The exposures were autoguided with a piggy-backed 8" reflector. Date and Location: April 4th, 2008, Fort Mckavett, Texas. Scope: Obsession 20? 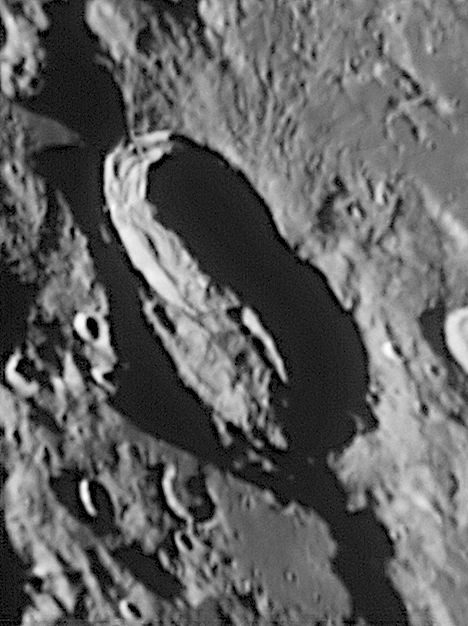 f/5 on a Tom Osypowski Dual Axis Equatorial Platform, Orion 100mm f/6 Guidescope. Autoguider: SC1 Mod Celestron Neximage Cam, Shoestring GPUSB guide port interface adapter, and Guidemaster software. Camera: Canon 20D DSLR (non-modded), homemade serial control shutter release cable, and DSLR Shutter from Stark Labs. Conditions: Temp 49F, Humidity 29%, Winds calm, Transparency 9/10, Seeing 7/10. 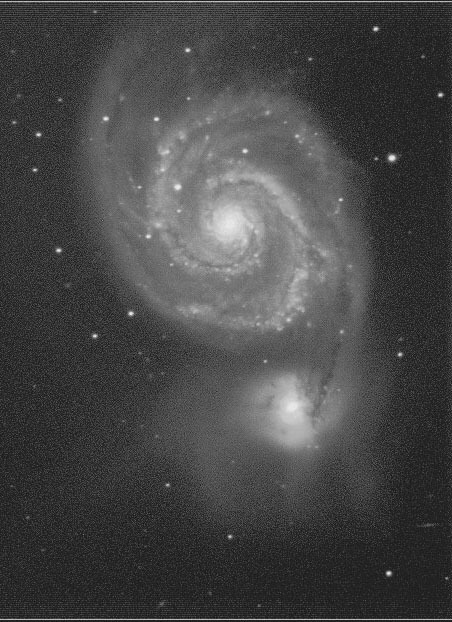 Exposures: 64 x 60sec @ 3200 ISO Sub Frames, 10 Darks average combined for master dark. 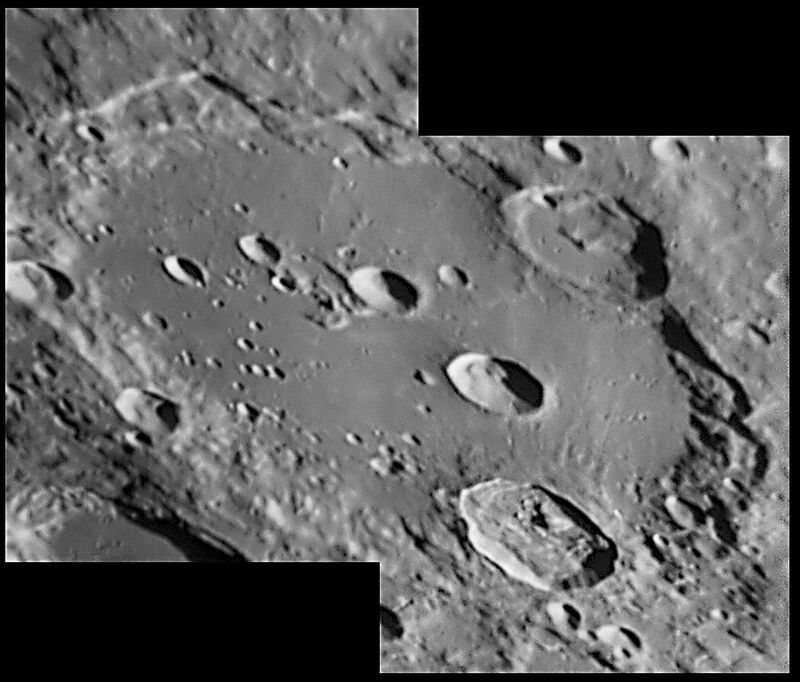 A mosaic of ten images taken with a 20" Obsession Telescope on a Dual-axis Aluminum Platform. Click on the image to see the remarkably detailed full shot. 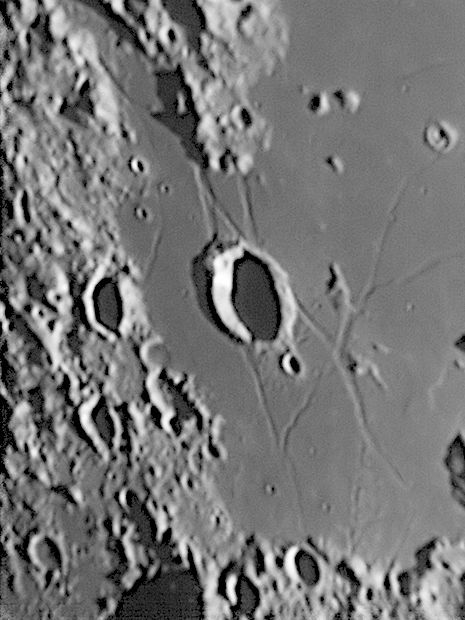 Deslandres region of the moon photographed on subsequent nights. Moon images take by Robert Schulz of Austria with a 12.5" Portaball Telescope on a Dual-axis Platform. Click images to view full size. 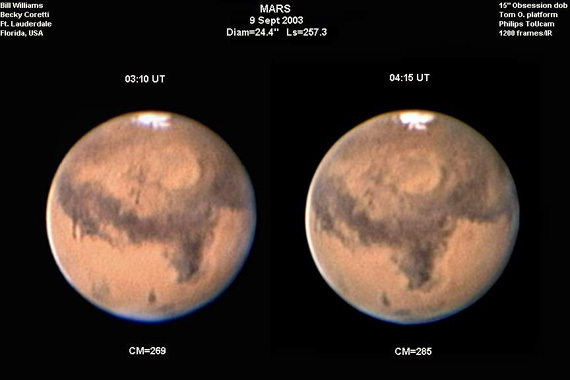 Glenn Schaeffer of Santa Fe, TX took these images of Mars. Here are his comments: "Thanks for the compliment. 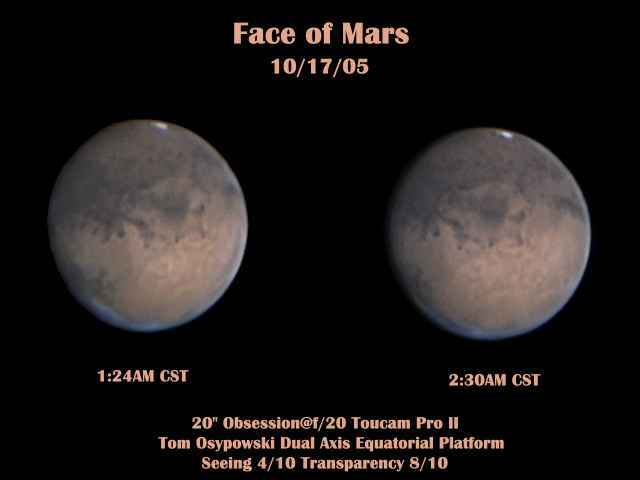 Of course you may use my Mars image for your site. Make sure you let your customers know that this was my "first" imaging session with your platform!!!! I used 823 of 1232 and 585 of 902 frames respectively. 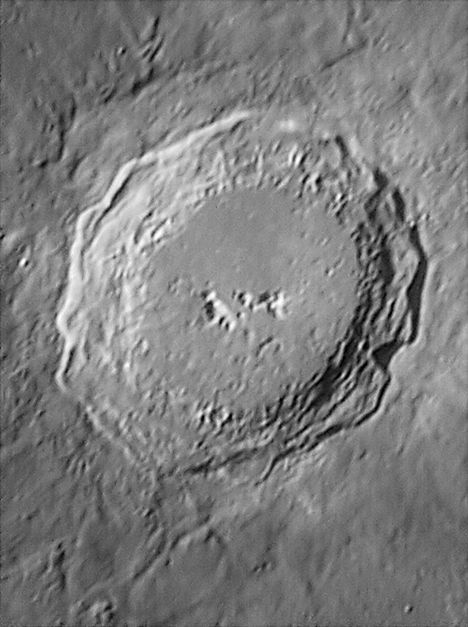 Was track and stacked with Registax3 and processed with the waveletts filters. Final editing was done with Ulead Photoimpact SE. 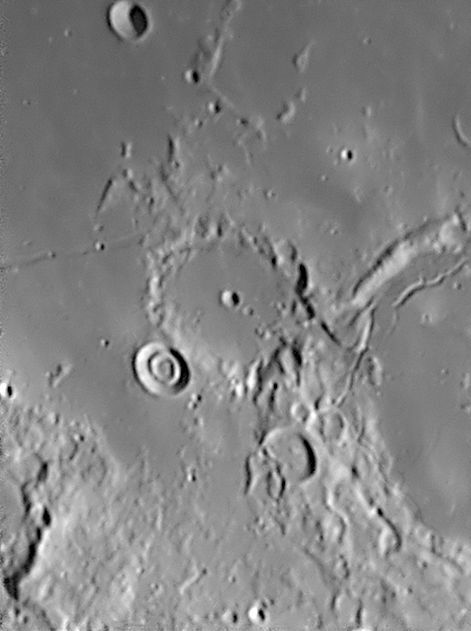 I obtained f/20 by using my 2x Super Barlow coupled to an old 2x Meade Shorty barlow. Kinda of a poor man's 4x Powermate. Seems to work ok for me. I've posted my results so far to my Club's user group (Johnson Space Center Astronomical Society), Toucam and Obsession Yahoo user groups. Been getting rave reviews with my image obtained with your platform. " 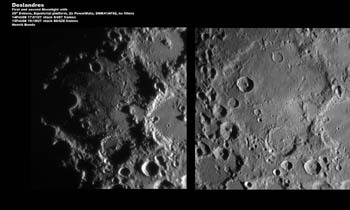 All three of these images were taken by Bob Brunck through a 25" f/5 Obsession with a 4.0" diagonal on a Dual-axis Aluminum Platform. All were guided manually with an 8" f/4 scope, using a 10 mm illuminated reticle eyepiece and a 2x barlow. All were taken with a standard Canon EOS 10D with a minus violet filter, without a Coma corrector, all with ISO 800. 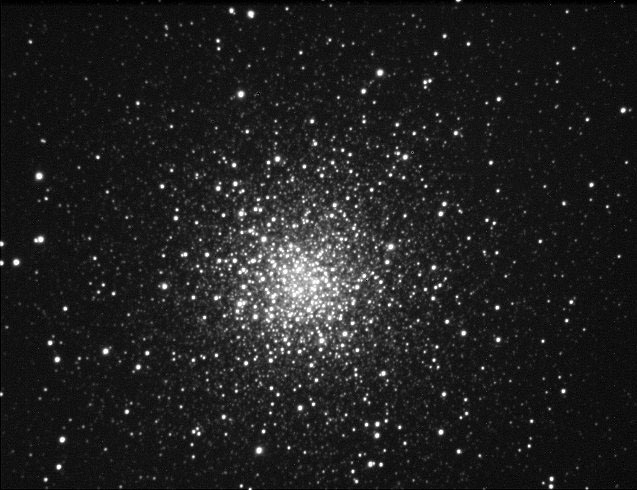 M13 is the combination of 2 x 10 sec, 2 x 30 sec, and 3 x 60 sec exposures. 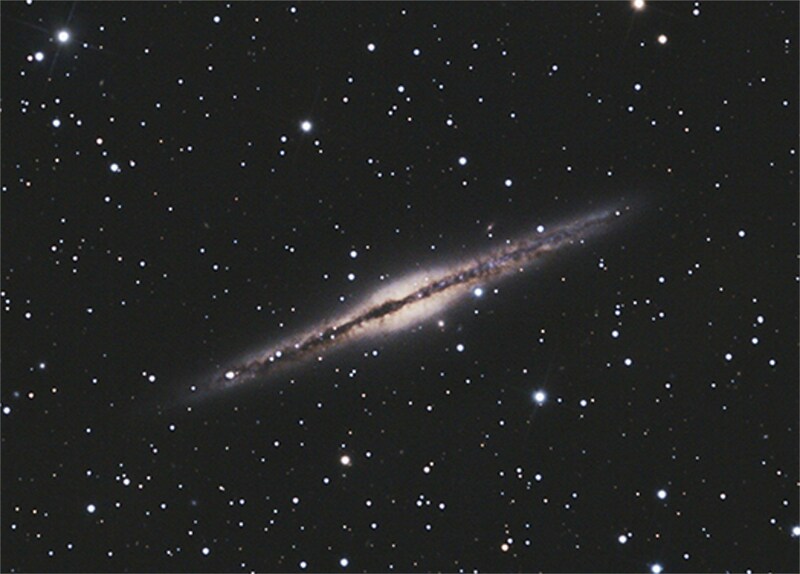 NGC 891 was the average of 1 x 120 sec and 3 x 180 sec exposures. 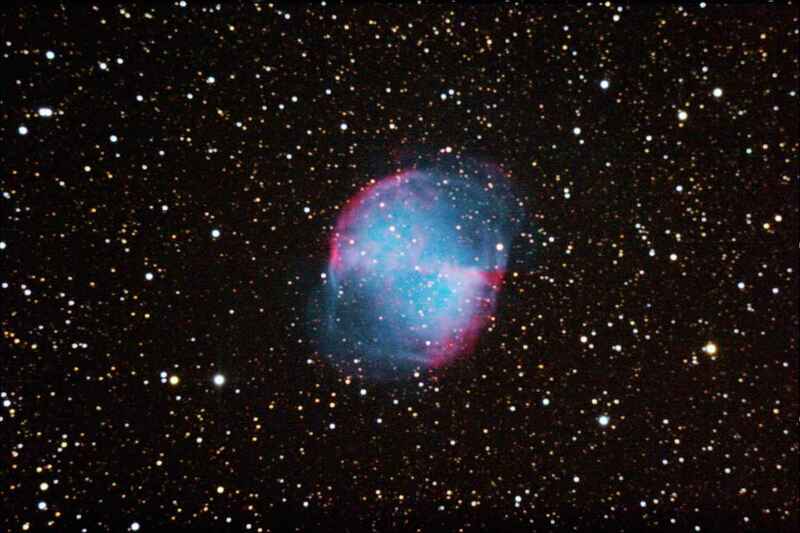 M27 is 3 x 120 sec. Images were combined and enhanced with ImagesPlus and ACDSee7. Taken by Becky Coretti with Bill Williams, using a 15" Obsession and a Tom O Compact Platform. A ToUCam was used with a TeleVue 4x Powermate. 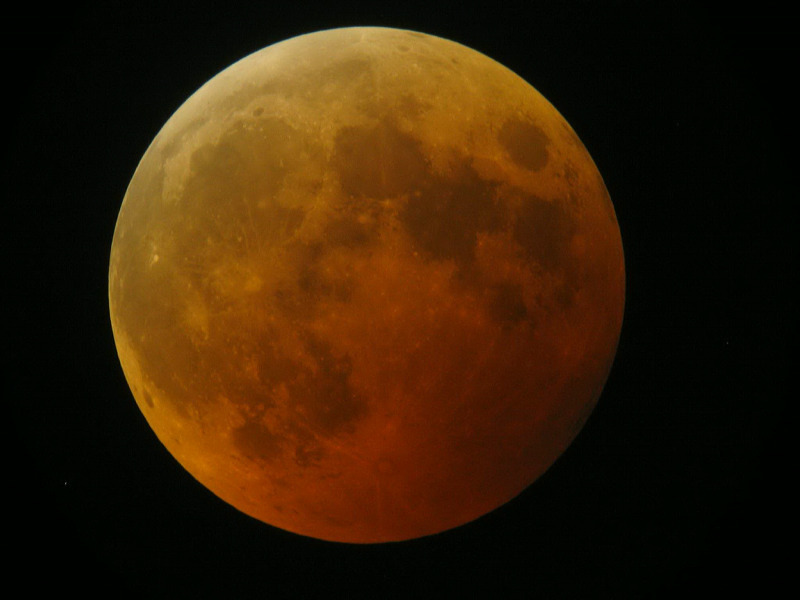 Total Eclipse of the Moon on October 27, 2004. 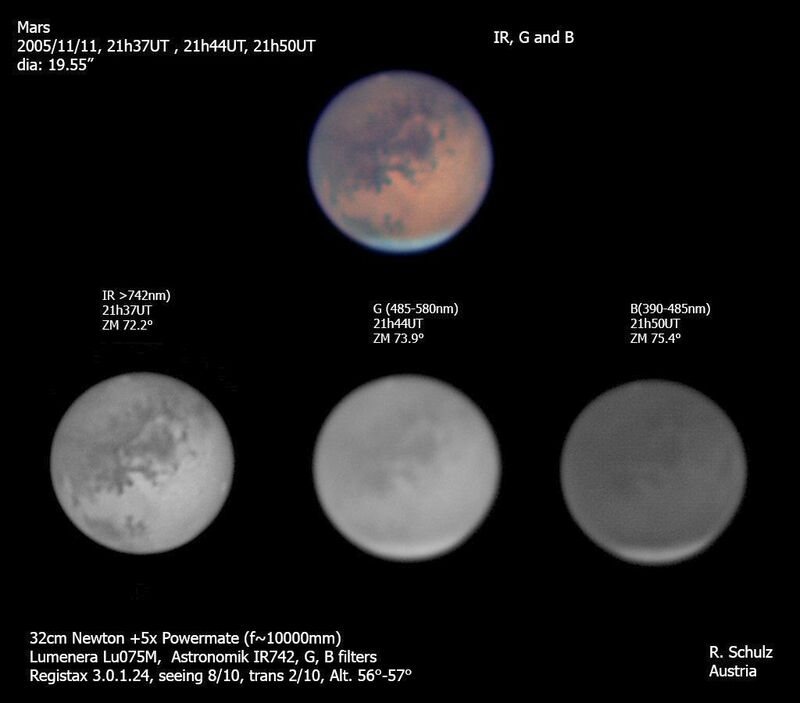 This image was taken by Gary Meehan with a 12.5" Dobsonian on an Equatorial Platform. Gary says, "This was about a 6 second exposure using a Canon PowerShot A70 and a 40mm Tele Vue Plossl. There's no way I could have made this shot without such a terrific product!" 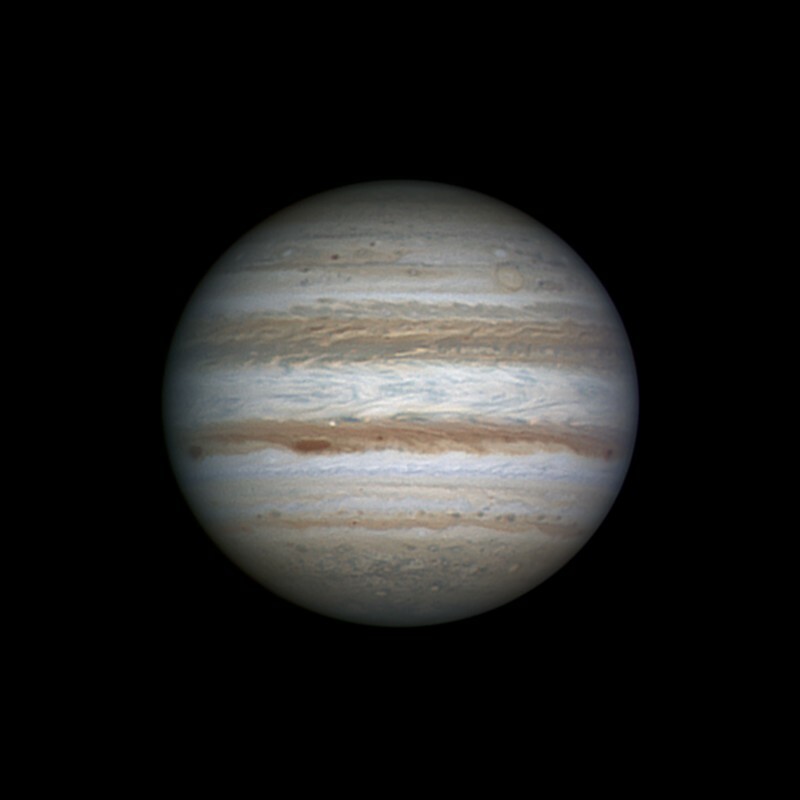 Jupiter taken through a 15" Obsession on a Compact Platform by Becky Coretti and Bill Williams at 1:15 AM EST on Feb. 7,2004. They used a Phillips ToUcam Pro 240K. The images were combined with Registax and processed in Photoshop by Tony Hallas. Here are Becky's comments: "Ganymede has detail!! Woohoo! 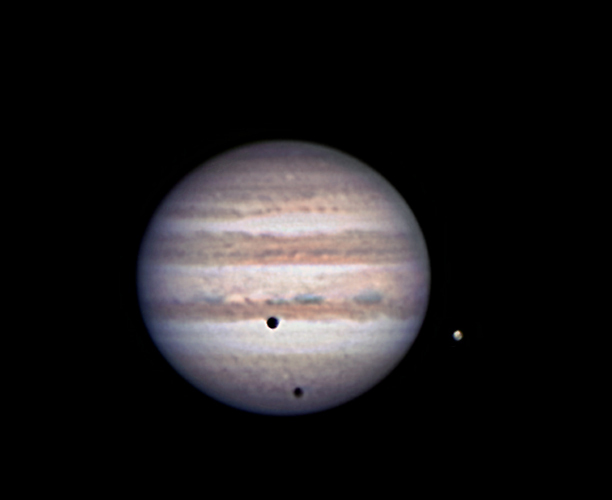 The shadow of Ganymede is seen to it's immediate left. The shadow below Ganymede's is not a shadow at all - rather it is Callisto, whose dark features make it appear as if there are two shadow transits! Kinda cool, huh? Thank you so much for your excellent workmanship. The platform is beautiful and exceedingly functional!" Comet Linear c/2002 T7. 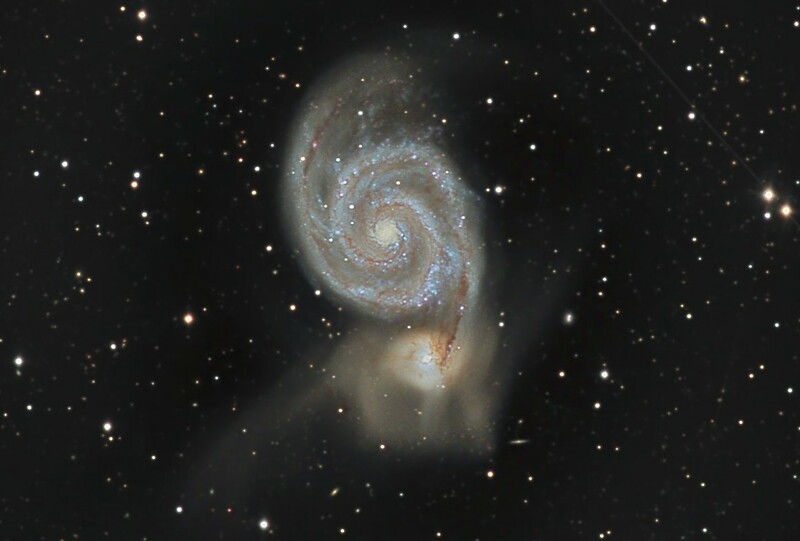 This is a combination of 20 - 30 second exposures taken by Doug Askew through an 18" Obsession Telescope riding on a Dual-axis Aluminum Equatorial Platform. 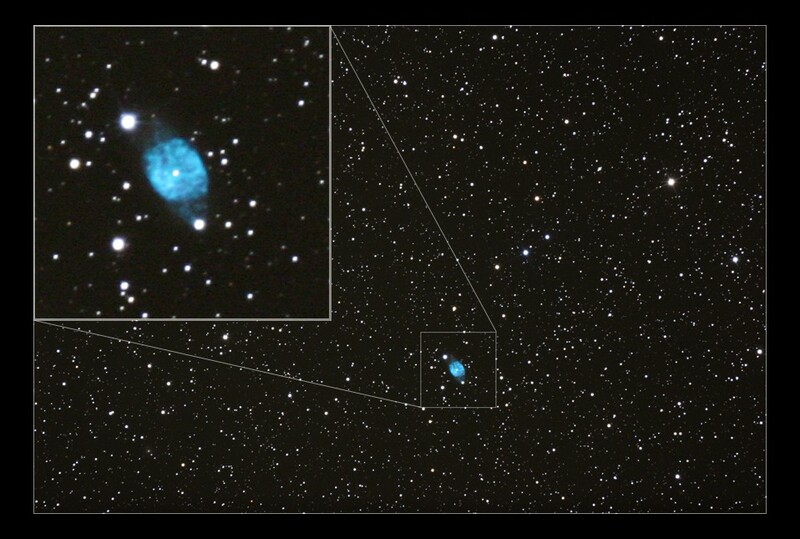 Doug used an SBIG ST-5c to autoguide the exposures. 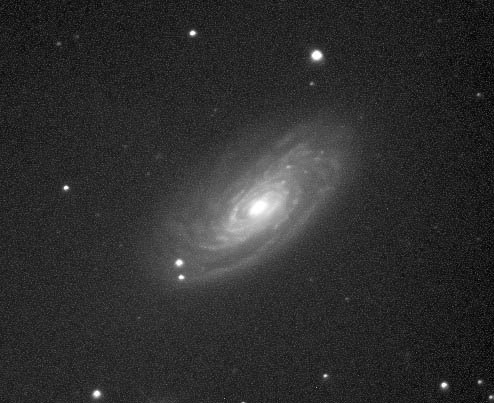 M76. This is a combination of 9 - 60 second exposures, taken with the same equipment as used for the Comet Linear image. 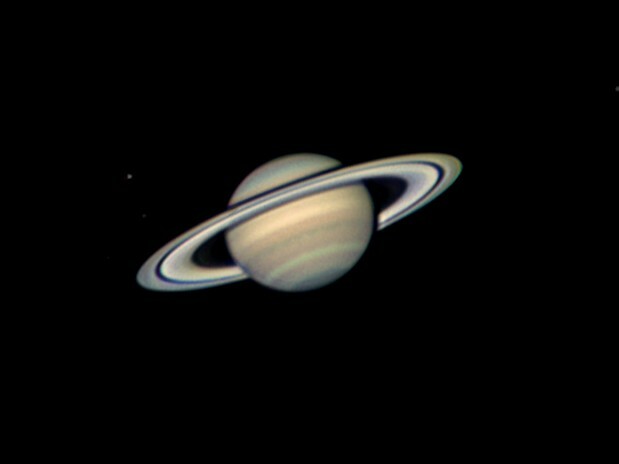 Saturn imaged with a Philips ToUcam using a 15" Obsession on a Compact Equatorial Platform. Photo by Becky Coretti and Bill Williams. "Your platform is excellent. 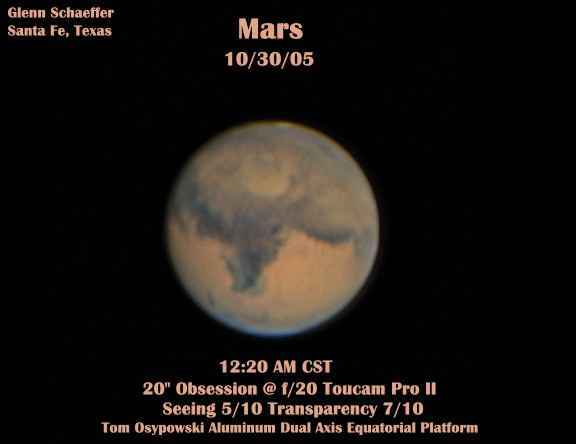 The frame of the webcam is only 40arcsec wide, and tracking must be perfect to obtain such results. With the two axis fine correction, centering of a planet is a snap. Thank you for this beautiful, technical, and precise platform...it is as important as the optic itself!" taken by Doug Askew with an 18" Obsession on a Dual-axis Aluminum Platform. 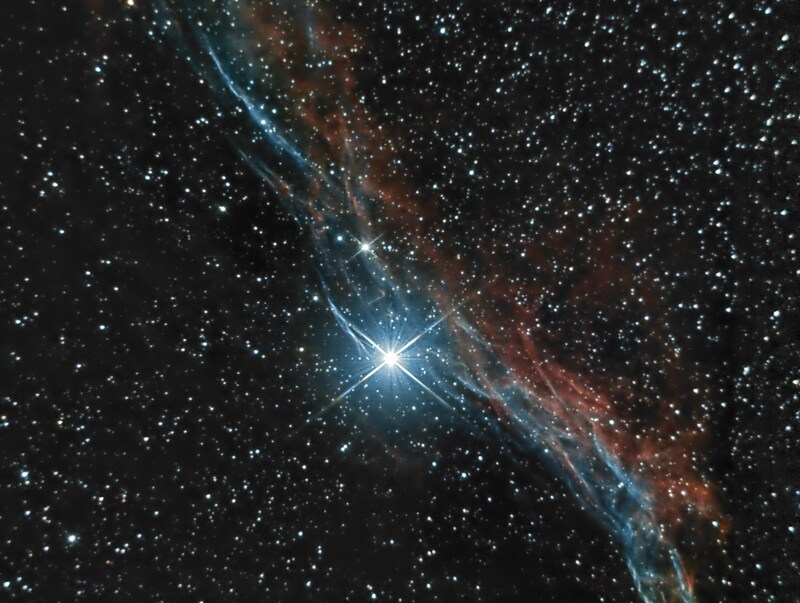 The image is a combination of 20 10sec unguided exposures taken with a Starlight HX9 CCD camera." 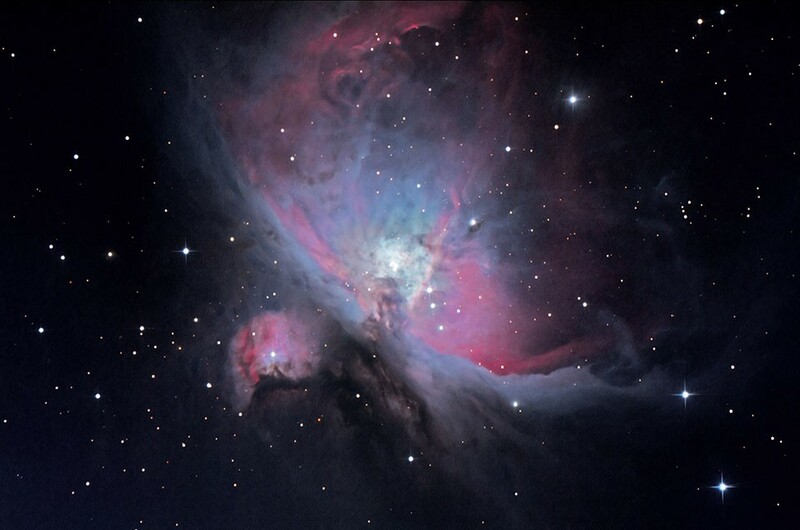 M42 - Photo by Del Johnson. 45 minute exposure using Fuji ISO 100 Superia print film. 12.5" f/5 prime focus with Lumicon coma corrector and ST-4 autoguider, off-axis. 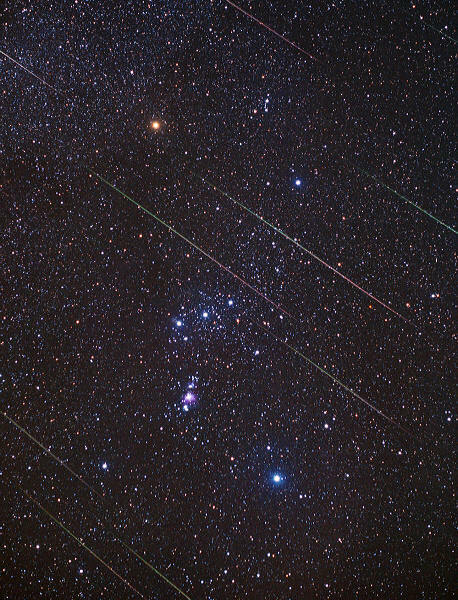 Leonids streaking through Orion. Photo taken with an Olympus 50mm lens at f2.8, piggy-backed onto a Dob on a Platform. Exposure was 10 minutes unguided, using Fuji 400 print film. Picture by Tom Osypowski. Image scanning and processing by Hallas Digital Services. 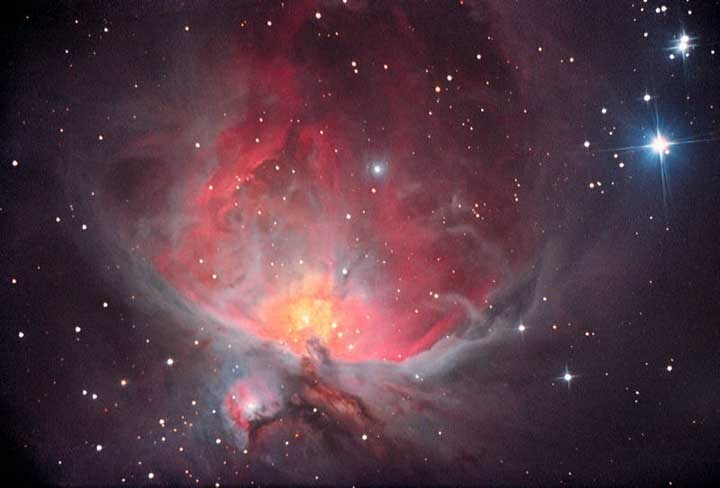 M42 -- the Orion Nebula. This image is a digital composite of two negatives taken on Ektar 1000 print film. Exposure of each negative was 7 minutes. The telescope was a 16" f5 Dob on a Dual-axis Equatorial Platform. Guiding was done with the Platform's hand control through a separate guide scope. Images by Tom Osypowski. 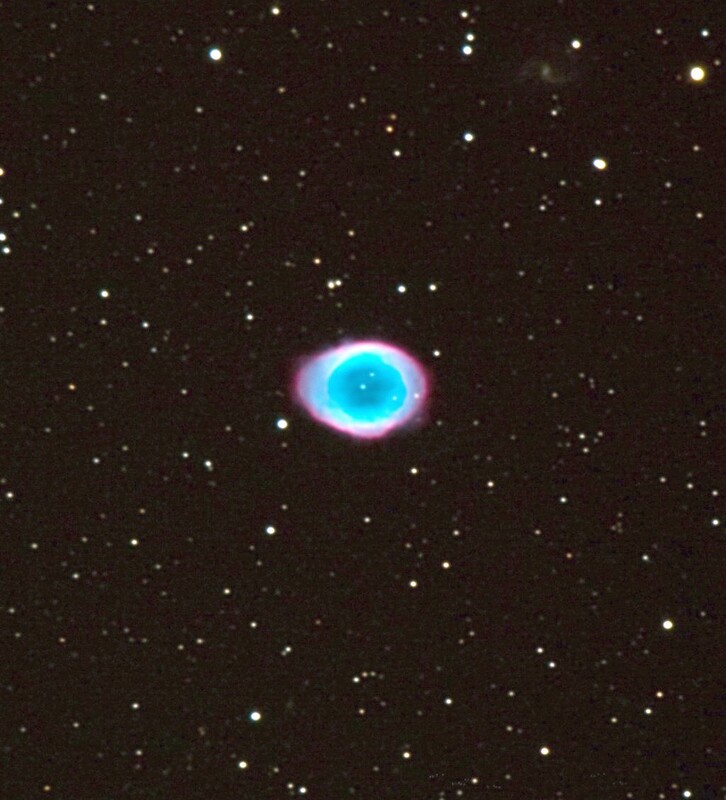 Scanning and image processing by Tony and Daphne Hallas at Astro Photo. 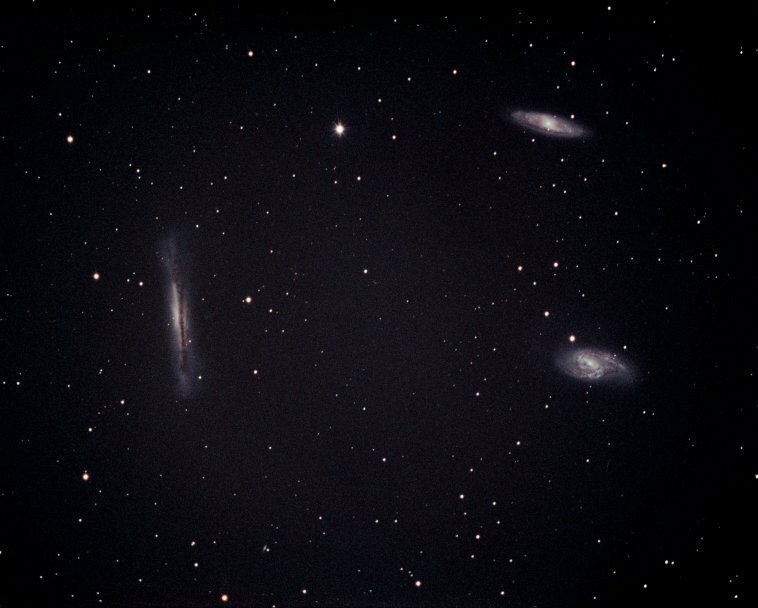 M65, M66 and NGC 3628 in Leo by Del Johnson. Prime focus of 12.5" f/5 reflector using the Lumicon Coma Corrector. Summation of three separate one hour exposures on Kodak 35mm Multispeed Ektapress print film, autoguided with ST-4 CCD. 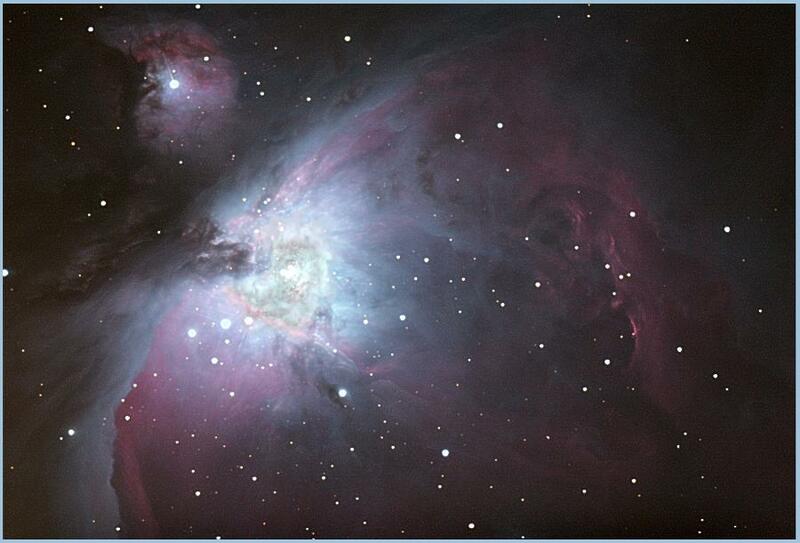 Negatives scanned and digitally stacked by Astro Photo. 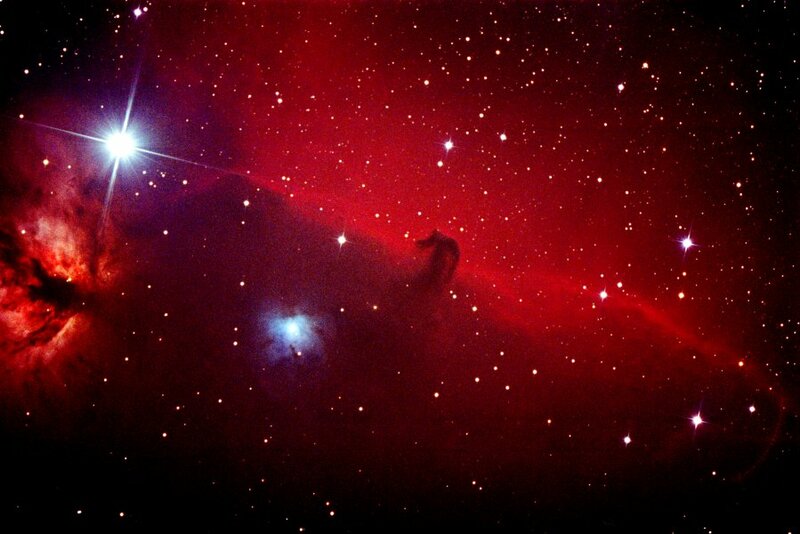 Horsehead Nebula: 60 minute exposure at prime focus of a 12.5" f/5 reflector with a Lumicon coma corrector, Kodak PJM Ektapress Multispeed film. Guided with an ST-4. 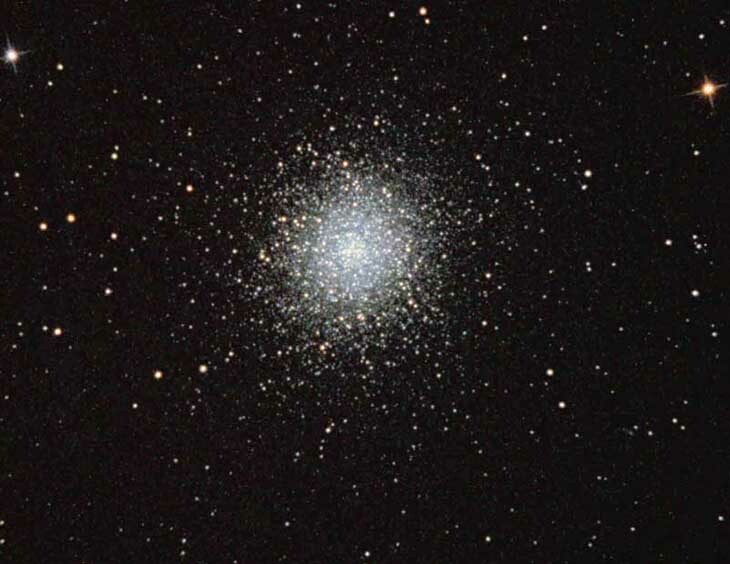 M13: a 10 minute exposure through a 16" f5 Dobsonian on a Dual-Axis Equatorial Platform, Ektar 1000 film. 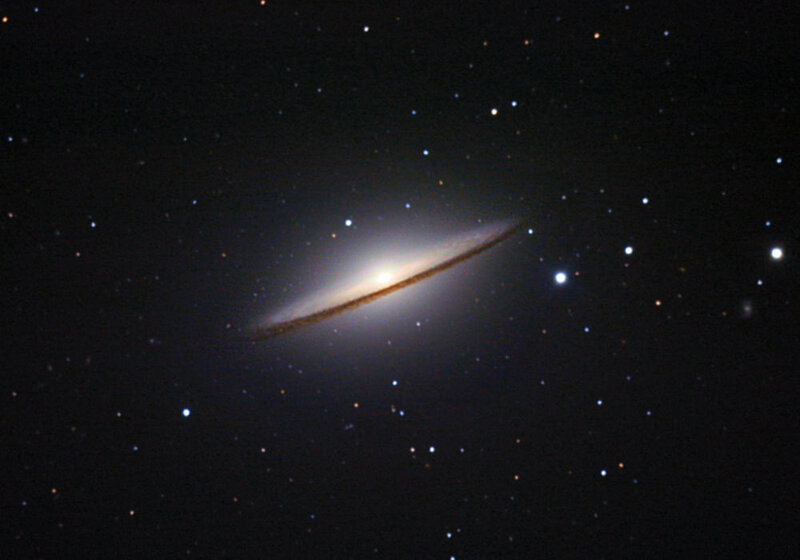 Image taken by Tom Osypowski. Image scanned and digitally processed by Jim Eiselt.